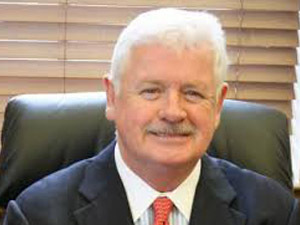 The arts community mourns the loss of long-serving Select Board member, Kevin Greeley. We thank him for being a strong supporter of the arts and making Arlington the vibrant place it is today. Mr. Greeley was a compassionate listener intent on making Arlington a great place to live for everyone. With a keen eye toward the future, Mr. Greeley always supported positive change and understood the impact of the arts as a way to open avenues of possibility and inspiration. We plan to carry out this vision and do you as proud as you have done us! 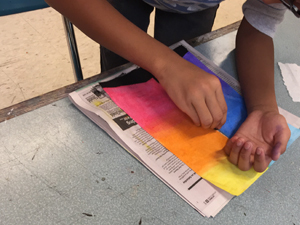 Young people in grades 6-12 who live in or attend school in Arlington are invited to create designs for colorful banners along Mass Ave. Twenty designs will be chosen by a panel that includes members of Arlington Public Art, a committee of the Arlington Commission for Arts and Culture. Students whose designs have been selected will be notified by the end of December. This year, panelists will also select three students to each receive a $200 scholarship prize to be announced at the spring reception. The designs will be printed on vinyl banners by Arlington Flag and Banner, and will be displayed along Mass Ave. in Arlington Center from April to September. When the banners come down, they’ll be repurposed into handsome tote and messenger bags and will be available for purchase. A reception to celebrate all participants will be held in April 2019 during the Arlington High School annual art exhibition. This year’s theme is trees in the broadest sense – their importance to our environment, the resources they provide, family trees – even characteristics such as life, strength, and growth that trees can symbolize. This is the first year that students are being asked to submit digital artwork as a preferred medium, however, drawings and collage will also be accepted to ensure the project remains accessible to any student who would like to participate. Last year nearly one hundred students participated in a contest from which 20 pieces of art were chosen to be printed on vinyl banners displayed from April through September along Mass Ave. in Arlington Center. The Youth Banner Project is funded by the Gracie James Foundation in memory of Gracie James, a talented teen who was a student at Arlington High School and who found solace and purpose in the arts. 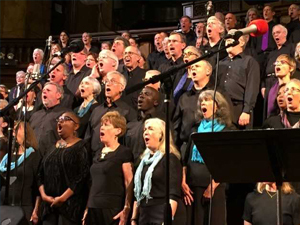 Experience the power of singing gospel music with more than 250 others as part of the Mystic Chorale, led by award-winning director and composer, Jonathan Singleton. The Mystic Chorale is a non-profit, non-audition, volunteer-run community chorus. The ability to read music, while helpful, is not required. Mystic welcomes all who love to sing! 8 weeks of rehearsals begin on Tuesday, January 8, 2018 7:30-9:30pm at First Parish Unitarian, 630 Mass Ave., Arlington Center. Concert weekend is Saturday, March 2nd and Sunday, March 3rd, Converse Hall at Tremont Temple in Boston. Visit mysticchorale.org for more information or to sign up. If you’d like to see the chorus in person, join them in Converse Hall at Tremont Temple on November 17 and 18. 175 Mystic Chorale voices sing out about the many dimensions of love, from the sweet blush of a new crush to the misery of a break-up to the tenderness we feel with a baby in our arms. Music ranges from the gentle caress of a Celtic ballad to the rock-out glory of classics, “Why Do Fools Fall in Love” and “You’ve Lost That Lovin’ Feeling”, from Katy Perry’s “Firework” to a Lennon-McCartney love song; from a rousing HAMILTON hit to a Doo-Wop medley. The audience will be up on its feet as the chorus belts out Aretha Franklin’s “R-E-S-P-E-C-T!” Guitarist extraordinaire, Gary Backstrom, leads the band. No other chorus moves hearts, bodies, and souls quite like the Mystic Chorale! Have you noticed East Arlington has gotten a little more colorful lately? Next time you are in the neighborhood of the Fox Library be sure to check out the new “Fox” mural by Somerville artist, James Weinberg, on the side of Za Pizza. 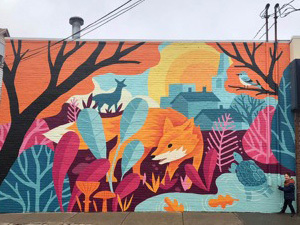 The mural is a celebration of local wildlife, while the fox has become a veritable icon of the neighborhood by virtue of the Fox parade during Feast of the East, the Fox Library and its mini fox murals by Shun Yamaguchi, and Artbeat’s Follow the Fox summer art adventure. Weinberg is a graphic designer, illustrator, and silk screen printer. His murals, featuring bright graphics and layering shapes and colors carry influences from folk art and silkscreen practices. Several of his murals can be seen at Assembly Row and other locations throughout Boston. Most recently, James Weinberg has become an author and come out with a children’s book, Contrary Creatures. Meet James Weinberg this Saturday, November 10 from 3-4:30pm at Porter Square Books for a book launch and reading. If you don’t catch him there, you might catch him riding his bike along the Minuteman Bikeway!